Please click here to read my review. This is a novel beautifully written! Sort of (not exactly) interlinked shorstories. It is just difficult to put in words the type of craft invested in the writing of this book, and mind you it is only a debut novel! It is a book that also involves you as a reader to piece the story together! I have also read Helon Habila's Measuring Time and yet to read Oil on Water which I have already purchased. This is actually the first time a Nigerian writer is making my book of the year, previously it has been Zimbabwe (2012), Mozambique (2013) and Tanzania (2014). Surprising right? This is going to be a whole different post, anyway. 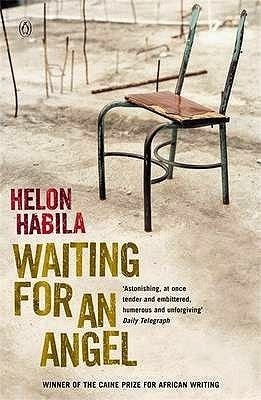 Have you heard of Helon Habila before? Have you read any of his published works? I hope you will be able to set your hands soon on Waiting for an Angel and read it if you haven't yet. Please click here to visit his website. Waiting for an Angel is an all time favourite for me. The story reads and impresses on you like 'clean water' Helon Habila is simply a gift to our generation. I hope to work with him someday. And to you Mary, compliments of the season. Keep up the good work. Hi Ayo, in my opinion I sometimes think that Helon Habila is an underrated writer. I know Chimamanda Ngozi Adichie is a god of a writer, I love her works. she is adecade younger than Helon and before she reaches his age, she would have produced a lot more interesting works. She already has, anyway. What am I saying? However, let me tell you that the quality of works so far produced by Helon Habila are on par with hers, nevertheless, they are never referred to with the same respect (in my opinion). Perhaps, it has got to do with marketing? No idea. I strongly recommend readers to read Helon Habila's works, they are excellent, the ones I have read so far; Waiting for an Angel and Measuring Time! Remember Helon Habila reached the limelight when he won the Caine Prize. And the world embraced him immediately. But Ms Adichie felt robbed of the same prize when her chance came, but she still went on to make a name for herself. As a matter of 'personal' comparison, Ms Adichie is a brilliant storyteller who simply wins the heart of an everyday reader, while Helon Habila is simply born to educate our minds with noteworthy ideals through the art of storytelling. Like I said earlier, I have read Waiting for an Angel, and I also purchased and read Measuring Time in 2008. But am yet to read Oil on Water. "And I guess a man’s importance in the world can be measured by the quality and number of his glories. It is a lonely thing but it relates us to the world. It is the mother of all creativeness, and it sets each man separate from all other men." I think that actually, they are both great writers, incredibly good ones. Hopefully, let them continue to write.. we would read and give our opinion.